Seeing Petron Blaze Boosters crushing Talk ‘n Text last night (August 5) was painfully surreal. 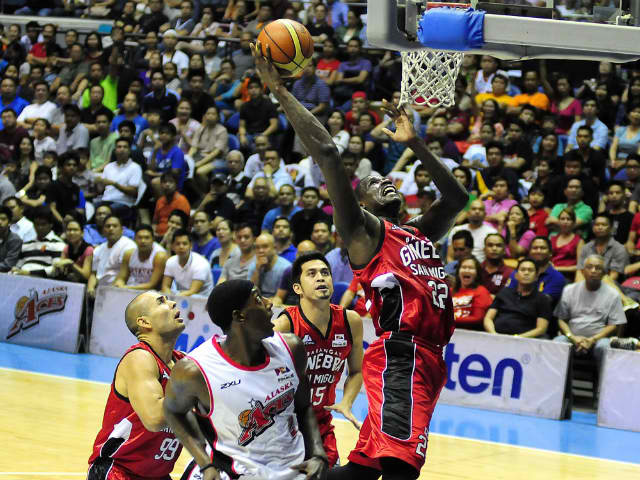 Not only it seemed, or rather was it conspicuously, out of calculations but also it dampened all the spirit and hopes of thousands of Barangay Ginebra fans for the Kings to have another crack at the championship. Analysts blamed the quotient rule, while the legions of Ginebra fans, more than anyone or anything, cast the stones to Talk ‘n Text. Talk ‘n Text, a team that modified its roster by recruiting the “most expensive” players over the past couple of years and owned by “businessman” Manuel V. Pangilinan, could have otherwise easily thwarted Petron last night with its pool of talented players. Any team that has won two straight championships, finished with the conference best record, booked the first seat in the finals, and averaged more than a hundred points per ball game, by all means, can mightily destroy an opposing squad that only relies on an Arwind Santos and an import by the name of Anthony Grundy. Yet, the whole Philippine basketball community was shocked by the sequence of events in the last day of the semis last night. Petron led by 20 points or more during most of the entirety of the game and finally beat Talk ‘n Text, 98-83. The games last night were to determine who will face TnT in the finals. It was a complicated situation, thanks to the quotient system, with three teams – Ginebra, Alaska, and Petron – viable to be that contender. Well, long story short, Ginebra was the most viable amongst the three. Not only did the team participated in last conference finals also against TnT, but also the Kings looked more deadly this conference with Mark Caguioa putting up MVP numbers, the return of his backcourt duo Jayjay Helterbrand, and an import who is a former boxer who is faster than anyone else. Granting that Petron loses last night and Ginebra wins over Rain or Shine, which they did, a rematch between Ginebra and TnT should have happen. Yet, the alternative and the nightmare of Barangay Big Dome happened. What I want to blame is Talk ‘n Text’s cowardice and indifference. 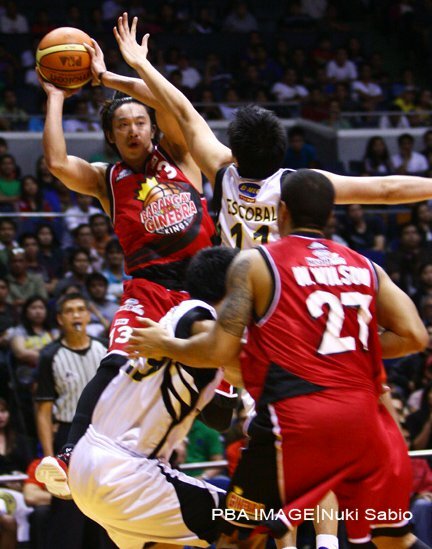 Everybody knew that Ginebra wass the best contender out there, and still is. Millions of basketball fans wanted to see that match up again. Yet, TnT made sure that they secure the grandslam by losing to Petron last night. They deliberately killed the majority of the fans’ excitement and enjoyment. They were playing for themselves alone, and did not even consider how it is better to give smiles to millions of basketball aficionados rather than securing laughter for Manny Pangilinan alone. Was it a matter of salary? Do they seriously want more money and incentives from Mr. Capitalist? And if they were really the best, why would they turn the people’s team’s challenge down? Scared? Afraid? I am frustrated. 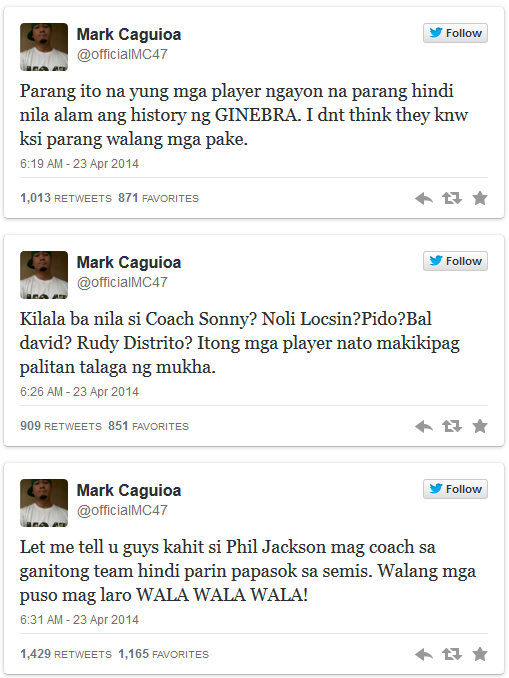 My co-Ginebra fans around the world are mad. Sports analysts are laughing because of the ridiculousness of last night’s events. To Talk ‘n Text and Manny Pangilinan, are you not sensitive of what the Filipino people want? If ever you win that grandslam, you know that you do not deserve it. All these years you were contending in the finals and no one has ever criticized you about your victories. But last night’s game was practically bullsh*t and now everybody, even your own crowd of supporters, is against you. Think about this thing, if you still ever know how to think for other people’s sake rather than your own self-interests. 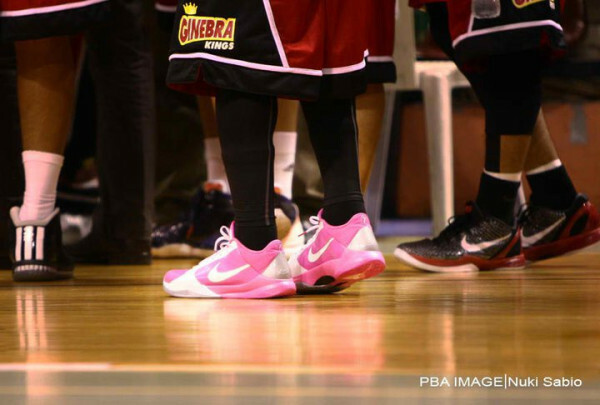 Long live Ginebra! In hearts and in minds, we shout NEVER SAY DIE!